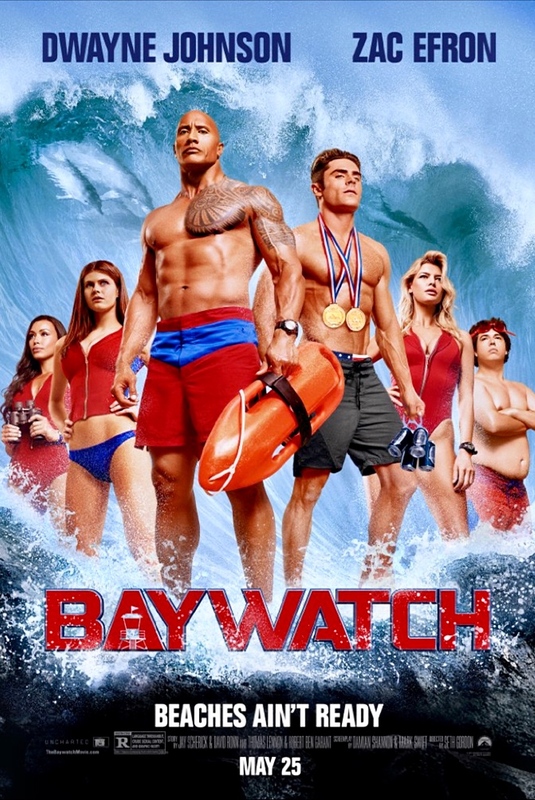 You can’t go to a reboot of the late 1980s TV beach ogler Baywatch without expecting a whopping serving of cheesecake shots and cheesy lines, plot and setups. The old school version, original network run and for years in syndication, gave America the team of David Hasselhoff and Pamela Anderson as Mitch Buchannon and C.J. Parker, lifeguards who guarded their Southern California beach with a passion for detective work, slow-motion jiggle and, well, whatever the show-makers thought they could get past the censors. Director Seth Gordon and screenplay writers Damian Shannon and Mark Swift have a new age and R rating to play with for their big screen vision. And so we get Dwayne Johnson as Mitch, Kelly Rohrbach as C.J., and a whole lot of the same cheese, different varieties. Johnson’s main partner in patrol turns out to be a guy, a former Olympian gold medalist who went on to disgrace played by an extremely chiseled Zac Efron. But only after much disagreement, parry and thrust between the two. Well, not really thrust. Efron’s Matt Brody wouldn’t mind with Summer, the proud lifeguard trainee played by Alexandra Daddario. Will they? How about hard-working Ronnie, eyes and more turned forever upward toward C.J.? Does Mitch have more than a professional thing for his second-in-command Stephanie, played proudly by Iifenesh Hadera? Before any romance, we must slog through not only this thin stew but a slew of silly and increasingly unbearable male-part jokes. The Rock tries to deliver it all with a sly smile. Efron by now makes a passable foil. Rohrbach and Daddario are likeable enough as proud-and-smart members of the crew. Hasselhoff and Anderson earn credits, too, by the end. The crowd of a couple dozen for a 12:30 p.m. Saturday showing at the Regal Cinemas big theater in Syracuse mega shopping, dining and entertainment complex Destiny USA filed out with barely a reaction. I saw a few parents with teens and wondered how and why either of them had gotten through it next to each other. Have a great day, Luis. LOL. I typically scan the audience for an “after the flick vibe” too. I suspected this one would be a little silly, and probably wouldn’t go see it, but might break the monotony with it via Amazon. It’s most likely to hit Netflix or Hulu soon anyways. Then I’d give it my 3-Minute-Test. No pass…No watch!!! Let me know if it gets to minute four, Sparkyjen!